Does Sound Transit, Metro want me to get back in my car? Why are Sound Transit and Metro diverting buses from downtown Seattle to address traffic congestion? Buses should stay and cars should be diverted. I’m starting to think Sound Transit and Metro want me to get back in my car and drive to work. First they took away my Redmond park-and-ride. And now they’re making plans to add at least a half-hour to my commute. I understand why transit agencies, government officials and business leaders are wringing their hands about traffic in downtown Seattle. But redirecting buses away from the city where most people work is an illogical response to increased traffic. The logical answer would be to push more buses toward downtown Seattle and South Lake Union, where I work, because buses carry a lot more people than cars. 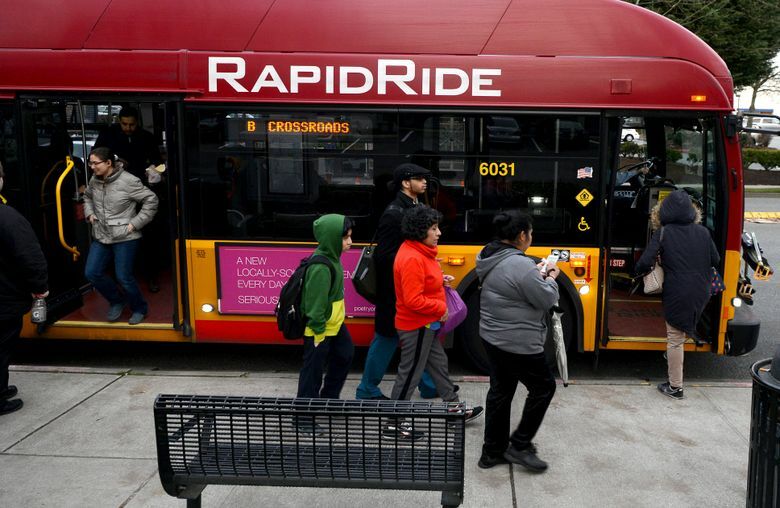 Transportation officials are worried because traffic is expected to get even worse when the Convention Place stop is closed in 2018 or 2019, forcing buses back up on surface streets. It’s clear from the surveys and outreach that people at Sound Transit and Metro know their traffic mitigation plans will affect a lot of people, including thousands commuting to Seattle each day from Kirkland, Redmond, Woodinville and Bellevue. So why aren’t they trying to make things better? Instead, the message I keep hearing is: Think of the future (six years from now) when you will have a beautiful train to take you from Redmond and Bellevue to downtown Seattle. They clearly aren’t listening to me or the people standing next to me on our crowded bus. What are we supposed to do for the next six years? It’s probably just a coincidence that my main commuting bus (Sound Transit Route 545 from Redmond to South Lake Union) and my two backup routes (Metro routes 268 and 255) will all be diverted to the University of Washington light-rail station under a plan being developed this year for implementation next year for Highway 520 buses. I stopped driving to work a year ago when I started my new job at The Seattle Times, which gave me a choice between a discounted bus pass or a much more expensive parking spot. I’ve learned to appreciate the bus, but the next choice will be even tougher. How long of a commute is just too long? I’ve been struggling to answer that question as I worry about the future. After the 520 route diversion, I will probably be asked to take a bus to the UW station, catch light rail to Westlake and then walk about 15 minutes to my office. My current two-bus commute — the RapidRide B and the 545 — is about an hour each way, including walking time. When I was driving, it was 30 to 45 minutes each way. With the new stop at the UW station, I expect to add at least 20 minutes each way. That’s 40 minutes a day I would rather be walking Daisy, my very active labradoodle puppy who needs the exercise to help curb her book-chewing obsession. That’s 3 1/3 more hours a week or 167 hours a year my bus friends and I will be taking away from making coffee for our spouses or cooking dinner for our families. We’re doing exactly what the transit agencies, government officials and our employers asked us to do: leave our cars at home and take public transportation. My route is far from the only one affected by these transit growing pains across the region. Metro buses from Kirkland and Woodinville (Routes 252, 257 and 311) would still reach the north end of downtown, but those riders with a job near Westlake, Pioneer Square or another area of downtown will have to make choices about the last leg of their commute: a long walk or another bus. Those choices will affect their families, their jobs and their lives. The plans are still a work in progress. There’s still a possibility the transit agencies will move routes around to fix my commute and yours. You can influence the result by participating in the rider survey. Metro and Sound Transit need to do more to make the transition as painless as possible for the next five or six years. At the very least, the agency should replace the parking eliminated by the park-and-ride closures. They should also explore whether more people can be brought to the edge of downtown instead of dropping them off in the University District. Surveys and open houses are not enough; we need alternatives and smart choices. The bus system or any other government agency can’t just say: Things will be tough for a while, thanks for your sacrifice, and it will be great in 2023. And then expect thousands of people to make the right choice and continue to take the bus.